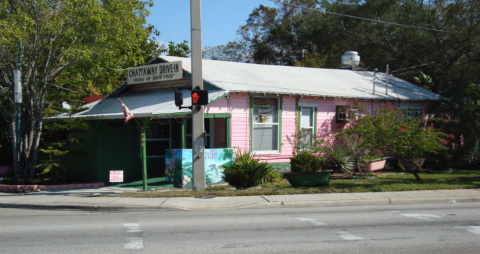 The Chattaway is an Old Florida restaurant in St. Petersburg, south of downtown and in a neighborhood not at all trendy. It has been operating as a business in one form or another for more than 90 years at this same location on the southeast corner of 4th Street South and 22nd Avenue South. In fact you may drive by it for years and never think of going inside. That would be your loss. A great visual and dining experience is yours once you park your car and walk into this place. The parking lot is behind the restaurant building, on the east side, and is entered from 22nd Avenue. This restaurant is off the beaten tourist track, and is highly favored by knowledgeable locals. The main entrance is in the back of the building on the parking lot. 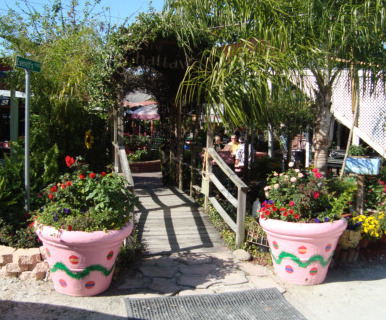 You will walk into an outside dining area that looks like a tropical nursery, and in many ways it is. Picnic tables are spread around under various awnings and shade sails and bordered by large trees. On a sunny day the light patterns are uplifting. It just feels like a happy place, and it is. Somebody years ago must have gotten a deal on used antique clawfoot bathtubs. 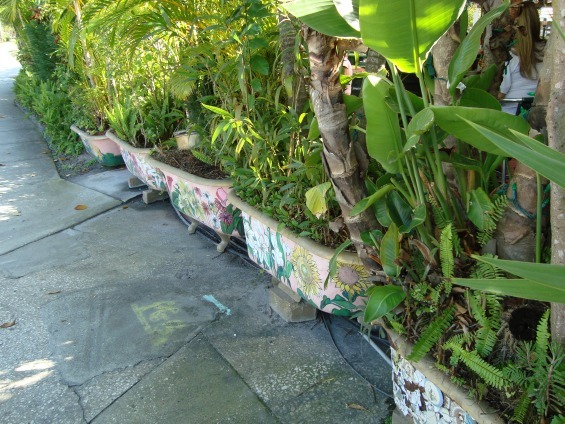 They are thoughtfully placed all throughout the exterior boundaries of the property and used as planters for an amazing variety of flowers and tropical plants. The minute you feast your eyes on this outside dining area, you will feel like you are in an authentic version of Old Florida. The atmosphere and menu are casual, and you can choose from a variety of soups, sandwiches, salads or larger entrees. The most famous dish here is the Chattaburger, a 7 ounce hamburger adorned with just about anything you could want on a burger. They also have a lot of seafood offerings. Beer and wine is also served. On my visit, I had a great bowl of chili and a grilled cheese sandwich topped with bacon. I tried hard not to visualize my cardiologist lecturing me on this, because I don't eat this way all the time. This was great, my New Years Day treat, and would make up for the Gator's disastrous performance the following day against Louisville in the Sugar Bowl. When it's time to pay your bill here, you will learn it's a cash only establishment. They do have an ATM if you don't have any cash. You will enjoy your visit.